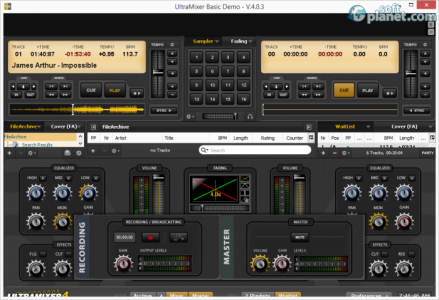 SoftPlanet makes it possible for everyone to get free UltraMixer Basic download directly from our servers. There is no registration needed for downloading. There are a lot of apps that aim at DJ's and try to reach other customers dealing with music business. 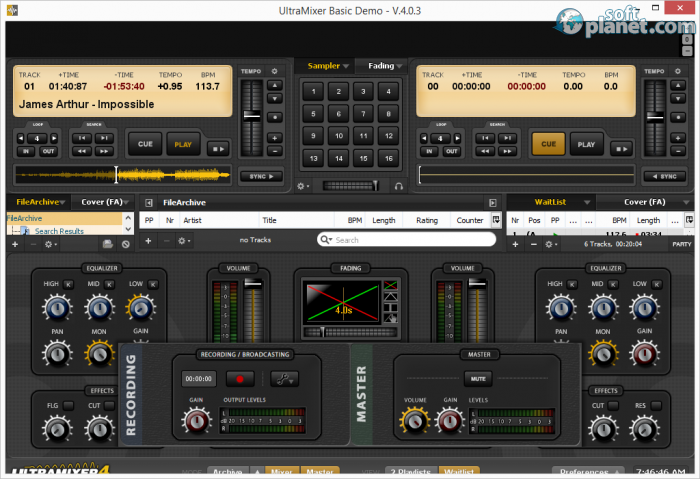 UltraMixer Basic 4.1.0 is one of these apps, but it has one major advantage against the competition. The app looks like and works like a real DJ station. But of course there is a catch, which shows that this is an app aimed mainly at professionals. You can try it only for 60 minutes for every startup. If you want to use it for londer you have to pay USD 59.95 for the Home version, USD 129.95 for the Basic version and USD 259.95 for the Professional version. The app can boast a lot of functions because it can play two songs simultaneously, which allows you to cross fade them, so that no one could understand when the deejay went from what song to another. You can also use the standard effect or you can add special effects, like a brake on the song, back spin or forward spin. The reverse was the funniest special effect that we enjoyed a lot, which is trying to listen to a song in reverse mode and you will laugh a lot. The app can also use an equalizer, which lets you adjust the high, mid and low frequencies, or the pan, mod and gain functions that are standard for a real DJ station. UltraMixer Basic 4.0.4 has an interface that can be described as a real DJ station, but it is of course digital. If you have ever seen a DJ station – it has the same play and stop buttons, the same equalizer and volume control and of course the same crossfader. The one thing that we didn't like was that the Sampler has only numbers so you don't know what button is for what sample effect. 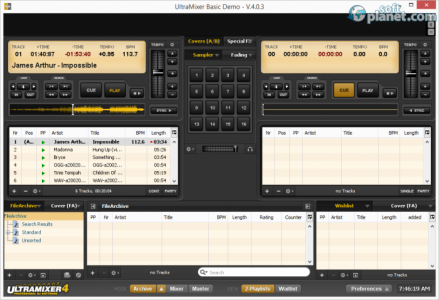 But this is how the sampler looks in the real DJ station, so probably developer UltraMixer Digital Audio Solutions GbR didn't want to spoil the overall look of the app. Of course there are some digital moments in the look of the app, since you can select between different effects, a clock or a fader, but this doesn't spoil the overall look of the real DJ station. 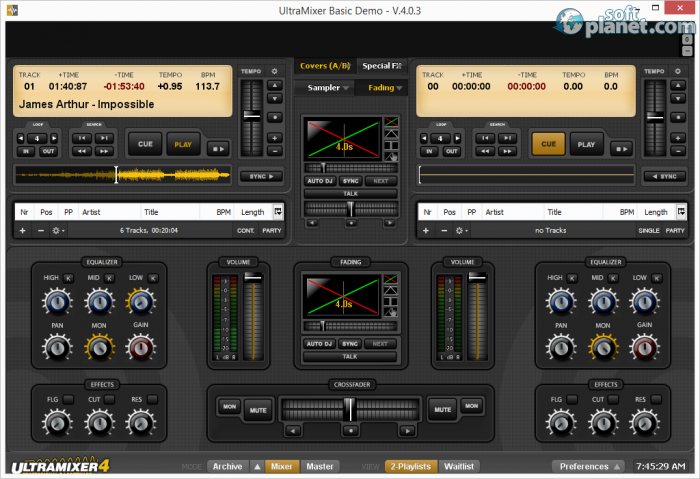 Every effect or process that we've tried with UltraMixer 4.1.0 worked without problems. The only setback that we had was during the startup process, but if you don't click too much on the icon you will not have the same problem. We had one problem while testing the app, because the app didn't want to start until we had closed older instances, but at the same time we could not find the old instance to remove it. But once we've restarted the operating system all started working properly and we could continue testing the program. We had a lot of fun while testing UltraMixer and we can recommend the app, but it is mostly for advanced users, because it costs a certain amount of money. It offers a lot of tools that will be useful for professionals. But you can still try it and have fun with the special effects and don't forget to test the reverse button, you will laugh yourself off your chair. Our security scan shows that UltraMixer Basic is clean from viruses. The current version of UltraMixer Basic has been scanned by our system, which contains 46 different anti-virus algorithms. That ensures that UltraMixer Basic 4.1.0 is 100% safe for your computer.